Opening Day is now only six days away, and at this point the Yankees still have nearly a full 40-man roster worth of players in big league camp. They have 35 players in camp and the World Baseball Classic is part of the reason. Some players, like Donovan Solano, have been in camp without actually being in camp these last few weeks. The Yankees and every other team needed the extra bodies while players were away at the WBC. All throughout this week the Yankees will cut down their roster as they prepare for Opening Day on Sunday. It’s late in camp, so not only will the big league players start playing a full nine innings and back-to-back days, the minor leagues need to do that too. There’s only so much playing time to go around, and at this point of the spring, it’s time for clubs to emphasize their MLB roster players. 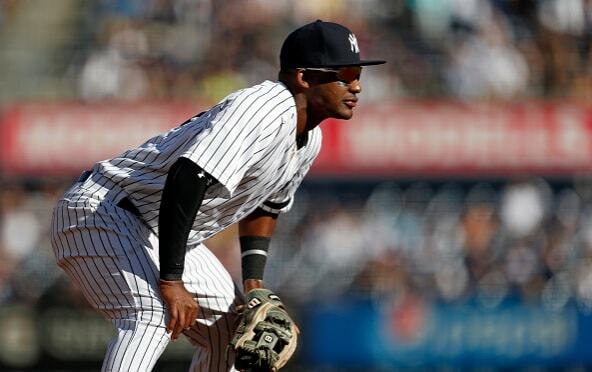 Earlier today the Yankees reassigned Solano, Wilkin Castillo, and Ruben Tejada to minor league camp, meaning there are now 35 players remaining in the big league Spring Training. Let’s take stock of those 35 players and figure out where they fit into the Opening Day roster equation. Some will definitely make it, some definitely won’t, and a whole bunch of guys are on the bubble. Let’s get to it. Might as well start here since this is our easiest and largest roster group. These are the players we know will be on the Opening Day roster in some capacity. Pitchers (8): Dellin Betances, Aroldis Chapman, Tyler Clippard, Tommy Layne, Michael Pineda, CC Sabathia, Masahiro Tanaka, Adam Warren. Position Players (11): Greg Bird, Chris Carter, Starlin Castro, Jacoby Ellsbury, Brett Gardner, Chase Headley, Aaron Hicks, Matt Holliday, Austin Romine, Gary Sanchez, Ronald Torreyes. Any doubt about Bird making the Opening Day roster was erased when he was named the starting first baseman last week. It was plenty fair to wonder whether he’d need some time to Triple-A to regain his strength and/or timing after missing the entire 2016 season with shoulder surgery, but he’s crushing the ball this spring. No doubts about him now. Everyone else is pretty straightforward, right? Right. Mitchell and Severino are both competing for a rotation spot, though I think they’re on the roster either way, starter or reliever. Mitchell won a bullpen spot in camp last year and he hasn’t really done anything to not deserve a roster spot since. I still think Severino is the odds on favorite to get one of the open rotation spots. I’m also not convinced he’ll go to Triple-A should he not get a starting spot. The chances of Severino making the Opening Day roster in some capacity sure seem pretty darn high to me. He’s not a lock, but the odds are in his favor. Baseball can be cruel. The Yankees lost both Didi Gregorius and Tyler Austin to injury this spring, and while neither suffered a severe long-term injury, they are going to miss the first several weeks of the regular season. Austin fouled a pitch off his foot and broke a bone. He could return to game action in mid-April. Gregorius strained his shoulder making a throw and could be out until May. Yuck. Both Austin and Didi are disabled list bound to begin the regular season. Most players in this group will be shuttle pitchers. Chad Green is competing with Severino and Mitchell (and Warren, I guess) for the two open rotation spots, and I feel the Yankees are much more willing to send him to Triple-A rather than stash him in the bullpen. Jordan Montgomery has impressed in camp, so much so that Joe Girardi is talking about him as a possible Opening Day roster option. Can’t say I expected to have him in this group at the outset of Spring Training. Aside from Green and Montgomery, the other three pitchers in this group are all relievers: Ben Heller, Jonathan Holder, and Chasen Shreve. We will inevitably see those guys in the Bronx at some point this season, though I’d say it’s less than 50/50 they’re on the Opening Day roster. Heller probably has the best chance to win a job out of camp. He’s had a fine spring and is, in my opinion, the best bullpen prospect in the organization. Rob Refsnyder, who has been mentioned as a trade candidate at times this spring, didn’t have much of a chance to make the Opening Day roster at coming into the spring. Then Austin and Gregorius got hurt which, if nothing else, opened the door for Refsnyder a little bit. His inability to play shortstop hurts him, obviously. The Yankees would have to be comfortable using Castro at shortstop. An unexpected Opening Day roster candidate is Tyler Wade, who has played well this spring and could get a look at shortstop while Gregorius is sidelined. The question is whether the Yankees want to tie up a long-term 40-man roster spot — the veteran non-roster infielders in camp can be dropped off the 40-man roster as soon as Gregorius returns, but Wade will be on the 40-man for good — so Wade can fill-in for a month. I have him in this group for a reason though. I think it’s possible the Yankees go with him at short while Didi is out. Ernesto Frieri: The Yankees signed him to a minor league deal two weeks ago, which suggests they were impressed by the way he threw with Colombia during the WBC. J.R. Graham: Graham recently had a three-run disaster outing, but eight of his ten Grapefruit League appearances have been scoreless. Ten strikeouts and two walks in 9.1 innings too. Pete Kozma: Kozma’s chances of making the Opening Day roster improved with the news of the Gregorius injury as well as the Solano and Tejada demotions. He’s a candidate to help fill in either at shortstop or as the utility infielder. With Gregorius hurt and two open bullpen spots, I’d put the chances of at least one of these five players making the Opening Day roster at: annoyingly high. My money is on Frieri making it. He’s looked pretty darn during the World Baseball Classic and with the Yankees, plus his experience as a Proven Closer™ will work in his favor. The Yankees reassigned their very best prospects to minor league camp last week, which took some of the excitement out of the remaining Grapefruit League games. It was that time of the spring though. The kids have to go get ready for their seasons. The at-bats aren’t there any more in the big league camp. The regulars are going to play and play a lot this week. The final player still in big league camp is catcher Kyle Higashioka. He is No. 3 on the catcher depth chart, which means he is heading to Triple-A Scranton until someone gets hurts or rosters expand in September, whichever comes first. Higashioka’s only chance to make the big league roster out of Spring Training involved and injury to Sanchez or Romine, and, thankfully, the Yankees have stayed healthy behind the plate. The Yankees have added righty J.R. Graham and lefty James Reeves to their list of non-roster players, the team announced. I didn’t even realize Graham was still in the organization. I thought he became a minor league free agent after last season. Huh. Anyway, there are now 65 players in big league camp. 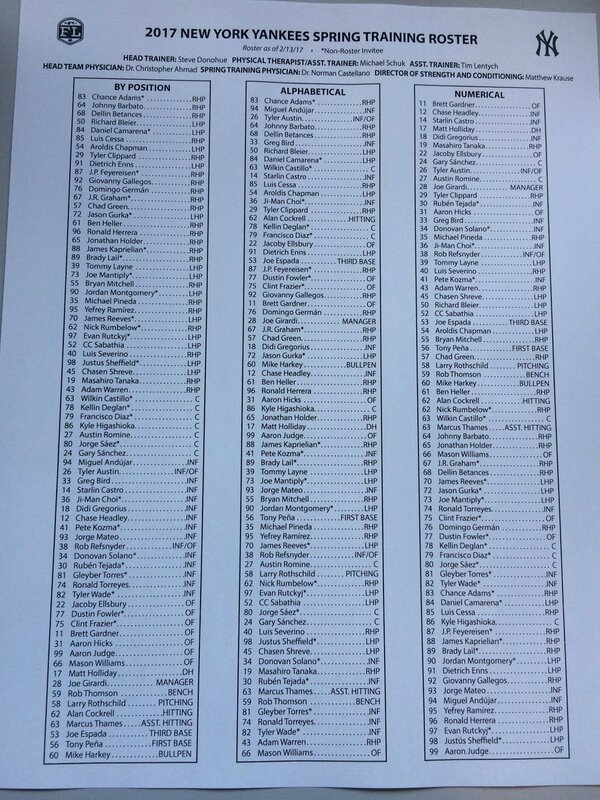 Here are the Spring Training uniform numbers, via Bryan Hoch. Nos. 13, 21, and 25 were not issued. I have no idea what the Yankees are planning to do with No. 21 long-term. 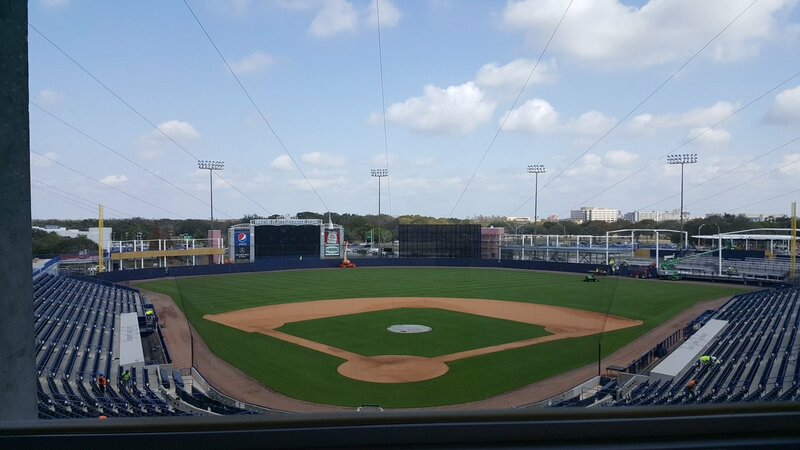 And finally, the renovations at George M. Steinbrenner Field in Tampa are still underway. Here’s a photof the place at the moment, via Mike Mazzeo. Good to have the camp notes back, isn’t it? They’ll get more exciting in the coming days and weeks, I promise. Anyway, here is tonight’s open thread. Both the Devils and Islanders are playing, and there’s some college basketball on as well. Talk about anything that isn’t religion or politics right here. After six months of red-eye flights and swanky hotels, the Yankees are playing their final road game of the 2016 season tonight. They’re an awful 35-45 on the road, which is their worst record away from Yankee Stadium since going 35-46 in 1992. Things aren’t so bad at home. The Yankees are 44-31 with a +21 run differential in the Bronx. 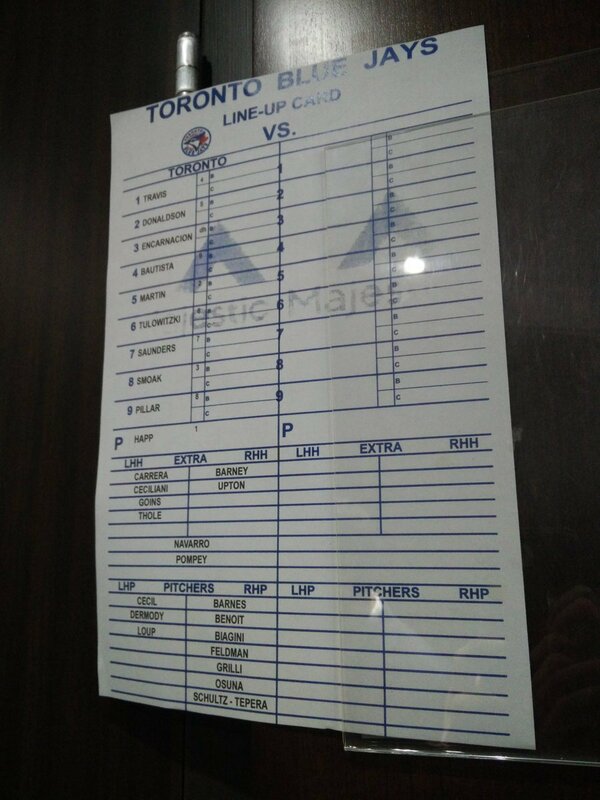 I have been informed by the internet that it is a cold and rainy day in Toronto, so chances are the Rogers’ Centre roof will be closed. Tonight’s road schedule finale will begin at 7:07pm ET and you can watch on YES locally and MLB Network nationally. Try to enjoy the game. Roster Move: The Yankees have outrighted J.R. Graham off the 40-man roster, the team announced. He is still with the organization, and I’m pretty sure Graham isn’t eligible for minor league free agency this offseason, so he’ll be back next year too. The Yankees have acquired right-hander J.R. Graham from the Twins for cash or a player to be named later, the team announced. He’s been optioned to Double-A Trenton. Mason Williams was transferred to the 60-day DL to clear a 40-man roster spot. Graham, 26, stuck with the Twins as a Rule 5 Draft pick from the Braves last year. He has a 5.10 ERA (4.63 FIP) in 65.1 career big league innings, all with Minnesota since the start of last season. Graham is a mid-90s fastball guy with a mid-80s slider that is his go-to offspeed pitch. He also has a changeup. Here’s some video. Fun fact: Graham wears old school stirrups on the mound because his mother is legally blind, and they help her pick him out on the field. That’s sweet. The Yankees have been hit hard by upper level pitching injuries early this year. A quick list of the walking wounded: Luis Severino (triceps), CC Sabathia (groin), Bryan Mitchell (toe), Nick Rumbelow (Tommy John surgery), Branden Pinder (Tommy John surgery), Jacob Lindgren (elbow), Tyler Cloyd (elbow), Kyle Haynes (lat), and Vinnie Pestano (unknown). Yeesh. The Twins designated Graham for assignment a few days ago as part of a roster shake-up and the Yankees picked him up to help cover for all those injuries. He’s a warm body for depth. That’s all. I wouldn’t be surprised to see the team pick up a few more scrap heap arms in the coming weeks.